Michael Robinson Chávez is a photographer at The Los Angeles Times and a working photojournalist. He has published photographs in the Washington Post, The Boston Globe and the Associated press, and he recently published a book of his photographs entitled "Awaiting the Rain." He has photographed on nearly every continent. He provides his viewers with haunting coverage of world events, including the Russian-Georgia war, the Battle for Fallujah, and the 2010 Chilean Earthquake. Cover of Awaiting the Rain. 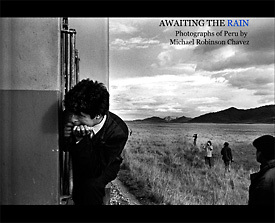 Awaiting the Rain by Michael robinson Chávez is a collection of Chávez' photographs from Peru, taken over the course of ten years of travel there.